LLB Office Lobby wins IES Award! 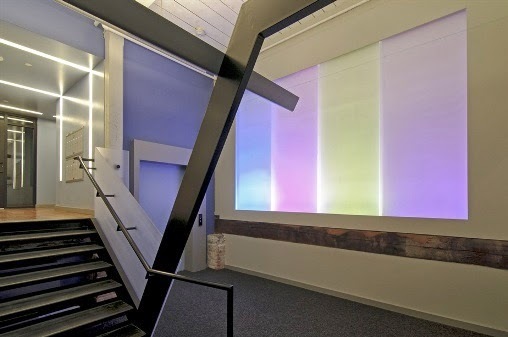 This month the Lighting Controls Association (LCA) Magazine is honoring our 2013 Illuminating Engineering Society (IES) Lighting Control Innovation Award for LLB Architects office lobby! These awards were created to recognize professionalism, ingenuity, and creativity in lighting design. 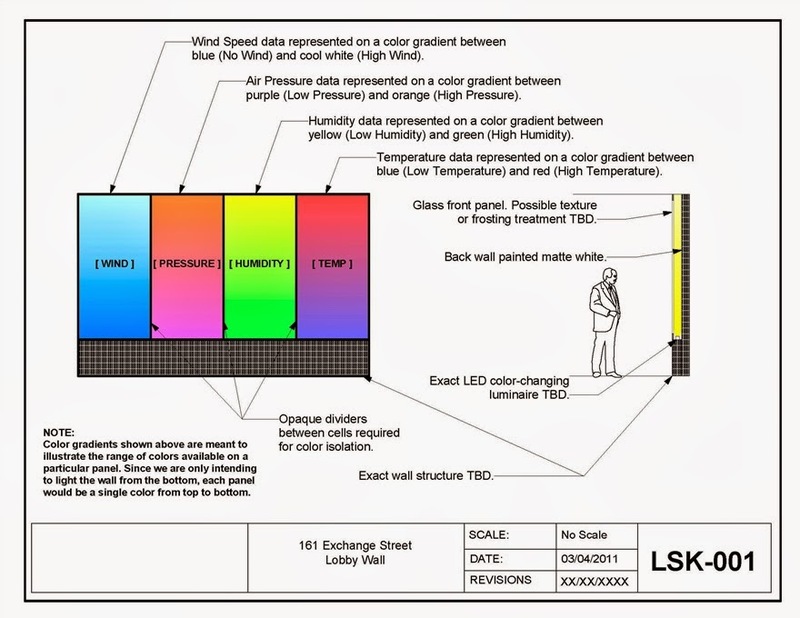 For the lobby wall at LLB Architects, we lit four translucent frosted acrylic panels, each 36”x96" that are connected to the internet through a computer. Every hour, the computer accesses weather data for the local area from the National Weather Service and determines values for the four characteristics the wall represents (from left to right); Wind Speed, Air Pressure, Relative Humidity, and Temperature. For each weather characteristic, an independent color gradient was established and programmed into the controller. For example, the Temperature gradient runs from blue for cooler temperatures to red for warmer temperatures. The installation has a rated life of 120,000 hrs and draws only 207 watts. The result is a low maintenance, budget friendly installation which stands as a subtle, ever changing representation of the world outside the lobby door, created through technology and light! Thank you IES for the Award! To read more about the specifics of the control system, check out The Lighting Controls Association article. ALD never stops thinking about ways to improve ourselves and our design process. 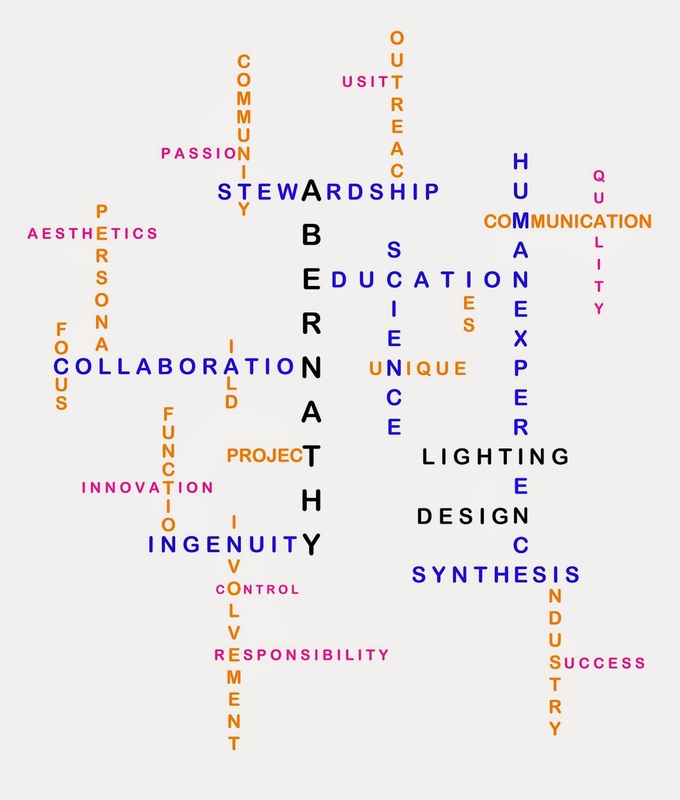 As part of that effort, we have created the word cloud to the right as a way of exploring the many aspects of quality lighting design. Within this cloud, you will find 7 focus points that the industry recognizes as key to the practice of lighting design. These points are indicative of our work ethic, our philosophy, and highlight why ALD is uniquely qualified to succeed. Stay tuned for further discussion on each focus point as we move forward. Thank you all for your continued support of ALD. 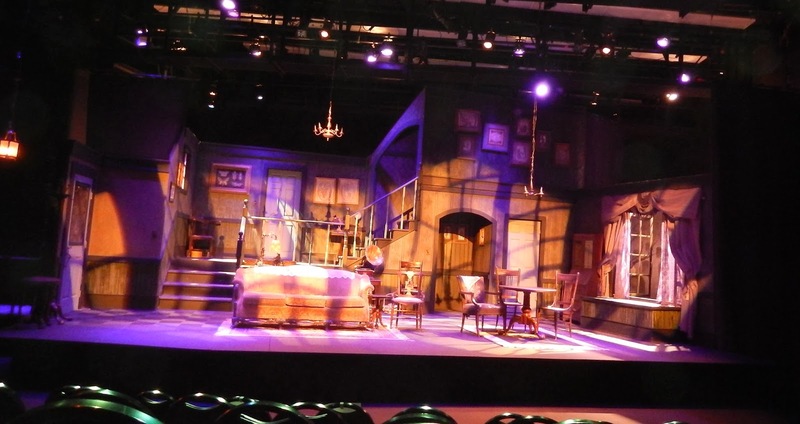 Along with our recent work on Rhode Island College's production of Arsenic & Old Lace, ALD is currently active in a number of other educational outreach programs. Kathy has taught numerous classes at the Boston College of Architecture (including a 4-week segment on lighting design earlier this semester) and is currently teaching a lighting design class at Rhode Island College for the Department of Music, Theatre, & Dance. This class meets twice a week from January through May and covers the basics of lighting design for a theatrical setting. Another upcoming outreach event is this Thursday at New England Institute of Technology (NEIT). Jason and Kathy will be holding a seminar there at 9:00am called "All's Well That's Lit Well" and covers the basics of architectural lighting design. Educational outreach is important to ALD because of our ongoing involvement with the International Association of Lighting Designers (IALD) Education Trust and the United States Institute for Theatre Technology (USITT). The mission of the IALD's Education Trust is "to support and encourage undergraduate and graduate education in architectural lighting design to ensure and enhance future growth and development of the independent lighting design profession". The Trust offers programs, scholarships, and stipends to both students and educators. To find out more about their programs, check out their website and the video testimonials on their page. USITT emphasizes theatrical lighting instead of architectural lighting and is an organization that promotes life-long learning. USITT is open for professional practitioners and students to join, to network, and to exchange ideas. They also offer funding resources and host a large annual conference that this year will be held in Fort Wayne, Texas later this month! Kathy will be attending this conference - so stay tuned for more details from the event! If you're interested in more information about USITT, their website can be found here. Being involved with IALD and USITT allows us to support professional and student lighting designers in both the architectural and theatrical fields.